In 1968 Detroit Receiving Hospital, through the generosity of Michigan artists and friends of the hospital, began an art collection designed to provide an environment colorful, attractive, and beneficial to patients, their families, and the hospital staff. Today, that collection includes more than a thousand works of art. The Healing Work of Art documents this amazing collection, highlighting the diversity of its holdings as well as its history. Detroit Receiving Hospital's extensive and beautiful collection now consists of the major sculptures pictured on their Web site, as well as eight hundred paintings, works on paper, textiles, and crafts. Over the years, the collection has been broadened by the addition of African beadwork, tapestries from the United State of America, Africa, and Columbia, a site-specific Pewabic tile water fountain, and large photo murals in the Emergency Department. The collection, which continues to grow in scope and quality, retains its original purpose of lightening the burden of illness carried by patients and their families and is a source of great pride to all who work in the Detroit Medical Center. 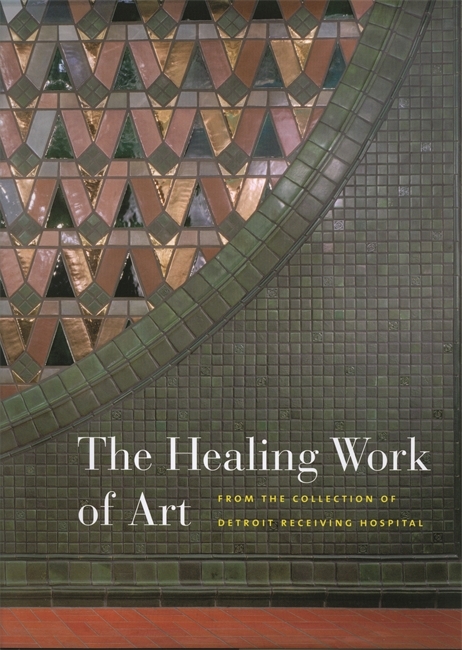 Art enthusiasts as well as those interested in Detroit culture and history will appreciate the look at the collection in The Healing Work of Art. Irene Walt is well known for her commitment to Detroit and dedication to the importance of public art in the city, and is the author of Art in the Stations: The Detroit People Mover. Grace Serra is an Art Advisor for Children’s Hospital of Michigan, Detroit Receiving Hospital and Huron Valley Sinai, holds masters degrees in fine arts and arts administration and an undergraduate degree in fine arts from Wayne State University. She has been a professor of art and art history at Henry Ford Community College since 1991.